Born Free’s Twist n’Pop Straw Cups are a really great option if you are looking for an easy to use, BPA-free straw cup for your toddler. The top very nicely twists to either cover or expose the silicone straw. It’s easy for your toddler to drink and still easy for you to keep the straw safe and clean without having to worry about keeping track of a cover. The cup holds a full 14 ounces and is still easy for little hands to hold. The ergonomic design and nubby pattern makes it easy for even the littlest hands to hold securely. In fact, it’s a very popular cup with all 4 of my children, ages 10 months, 2, 3 and 5 years old, so it’s great for more than just toddlers. The Twist n’Pop Straw Cup is also easy to take apart for cleaning, is top rack dishwasher safe and quick and easy to put back together. The top is also wide-mouthed, so that adding ice cubes is a snap. The cup is offered in 4 colors, Blue, Green, Pink and Yellow and retails for a very reasonable $7.99. 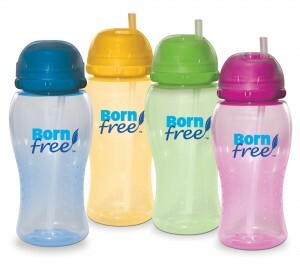 You can find the cup as well as the full line of Born Free Products on the Born Free site.